White, purple or green, asparagus is a seasonal vegetable that is eaten in springtime only. It needs hardly any trimmings to be simply delicious! Asparagus is one of the foodstuffs that contains the most B9. It is known as an “intestinal broom”. It is a spring vegetable that is enjoyed in season. Eating asparagus gives a particular smell to urine. It is produced in more than 60 countries worldwide. 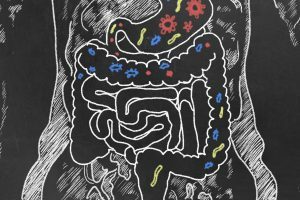 An intestinal broom Asparagus contains soft fibers, in particular inulin, which is very efficient for stimulating and regulating bowel movement without hurrying. That is what gave it this eloquent name! But its real nutritional characteristic is its richness in foliates or vitamin B9, which is very important in the first three months of pregnancy. It is one of the foodstuffs that contains the most vitamin B9, just after beef liver and certain legumes. The vitamin B9 content of canned paragus is similar to that of fresh asparagus after cooking. 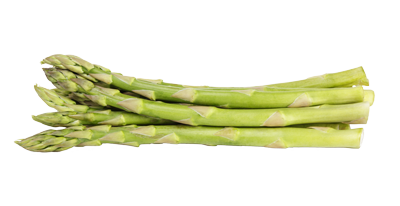 Low in sodium although it contains potassium, asparagus has natural diuretic qualities to which it adds natural “fragrance”! 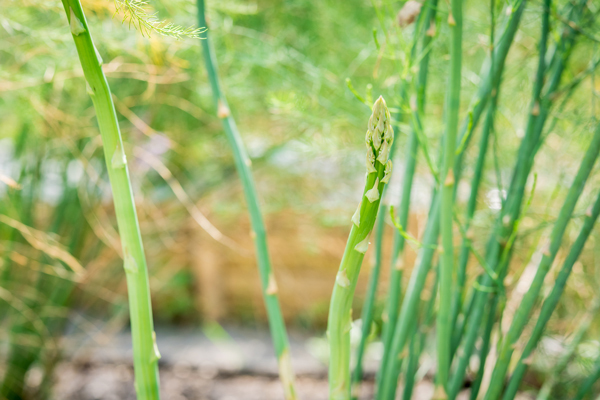 That characteristic smell of urine after eating asparagus is due to the presence of sulfur compounds called mercaptans. Asparagus further contains antioxidants (flavanoids and carotenoids). But these are present only in asparagus with color: Purple and green asparagus contain a lot more flavanoids and carotenoids than the white ones (which also have less vitamin C). Asparagus are picked only from mid-May to the end of June. Grown worldwide, fresh asparagus can already be found on the shelves as early as March, but rarely beyond June. Growing asparagus is complex and picking them is technical and fast. Asparagus is a herbaceous, perennial plant with a rhizome (a subterranean stalk) which likes sandy, light, deep and well-drained soil. It’s an art in itself! The stalks must be firm and brittle, of equal thickness (to cook evenly) with a tight tip. The moister the heel (lowest part) is, the more recently it was picked. Green asparagus must be evenly colored from tip to end. Choosing them is an art. Make sure the stalks are firm and brittle, that the thickness is equal (to cook evenly), and that the tips are tight. The moister the heel (lowest part), the more recently it was picked. Green asparagus must be evenly colored from tip to end. 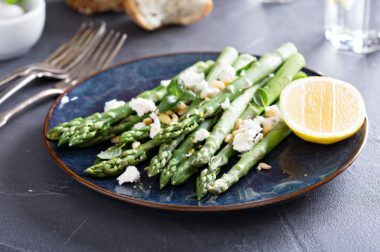 Asparagus is fragile and must ideally be eaten within three days, for the longer it is kept, the more fibrous it will become (especially if it is stored at room temperature). first wrap the base of the bunch in moist kitchen towel then put them upright in a plastic or cloth bag. Or place them vertically in a bowl with 5 cm of water. Once they are cooked, eat them quickly, or they will lose their taste and become limp. To enjoy them for a longer period in the year, you can blanch them for 3 minutes in boiling water and then keep them for 8 months in the freezer. Green asparagus are the only ones that do not need to be peeled; simply wash them. Note: Don’t peel the tip; stop three centimeters before the tip. 20 minutes: for white or purple asparagus, tying the bundle with string in a pot of boiling water (there are even pots with a specific format) or in the oven, in paper parcels. 10 minutes: In a pressure cooker, always for white or purple asparagus. 5 minutes: for all kinds of cooking for green asparagus. Once they are cooked, plunge them in a bowl of ice water to preserve their green color. Avoid the microwave: the maximum temperature (100°C) is not high enough to soften them. Like to keep things simple? So does asparagus! Try them doused in a vinaigrette with old-fashioned mustard, some fresh herbs and chopped hazelnuts. In Belgium, they’re eaten mostly Flemish style with a hard-boiled egg and melted butter. White asparagus is excellent in soup or with cream, but also baked. Chopped in pieces, they can be used in a quiche, an omelet, a savory crepe or risotto. They also go well with poultry, mild cheeses and white meats. 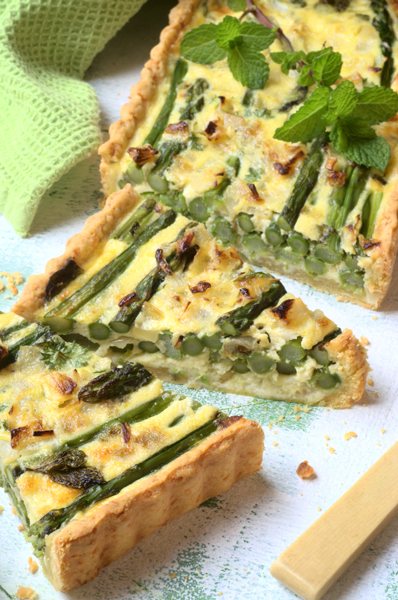 Green asparagus is delicious with eggs, cheese like Parmesan, spinach, fish, cream and herbs. Asparagus has subtle flavors that are not only for adults: little ones will love eating them with their fingers from the age of 8 months. Make sure they are well cooked, and pick out the most tender part for them, in other words the tips. The softness of asparagus makes them ideal at any age. The subtle taste is a treat for all food lovers. Origins: More than 60 countries worldwide produce asparagus, with temperatures that vary from cool to tropical. China is the biggest producer, ahead of Germany, Spain, Italy and France. Peru, the USA, Japan, Mexico, Spain and Germany are the biggest consumers of asparagus. Followed by Greece, Switzerland and the UK. White asparagus (70 % of the overall production) is grown without exposure to air and sunlight (covered with soil or “earthed up”). Purple-tipped asparagus (20 %) of which the tip has broken through the soil and taken color. 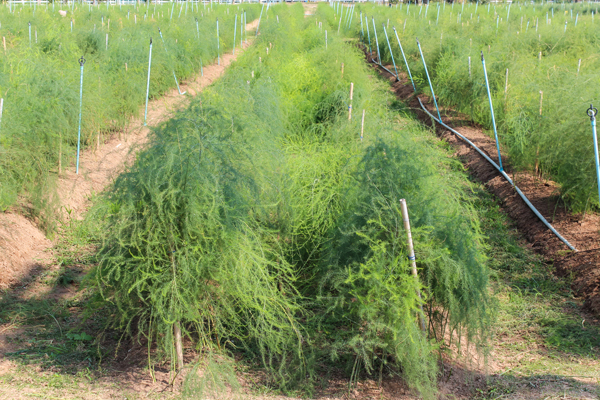 Green asparagus (10 %) which grows exposed to air. More rarely one finds “purple-green” asparagus of which the stalk remains buried (white), with 1/3 exposed to air (green) and a purple tip. There are numerous labels and protected geographical indications (PGI) that are all used as criteria for asparagus. The most famous are for example the pink-tipped asparagus of Mezzago, Italy, or the green or purple ones from Albenga. 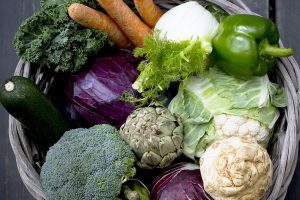 How Can We Help Children Appreciate Distinctive Vegetables? 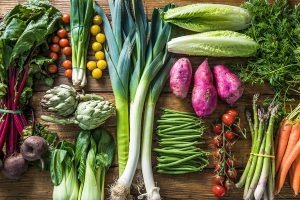 Why Are Seasonal Vegetables So Good for You?